TUESDAY, Nov. 25, 2014 (HealthDay News) -- Eating a serving a day of yogurt may lower your risk of developing type 2 diabetes, new research suggests. "The data we have gathered show that yogurt consumption can have significant benefit in reducing the risk of diabetes," said senior study author Dr. Frank Hu, a professor of nutrition and epidemiology at Harvard School of Public Health, in Boston. "It's not a huge effect, about an 18 percent reduction [in risk]." "Yogurt is not magic for curing or preventing diabetes," Hu said. "That's the bottom line and the message we want to convey to our consumers, that we have to pay attention to our diet pattern. There is no replacement for an overall healthy diet and maintaining [a healthy] body weight." The study is published online Nov. 24 in the journal BMC Medicine. It was funded by the U.S. National Institutes of Health. In type 2 diabetes, the body does not produce enough insulin or the body's cells develop a resistance to insulin, and blood sugar levels then get too high. For the study, Hu and his team pooled the result of three large studies that tracked the medical histories and lifestyle habits of health professionals: the Health Professionals' Follow-up Study of more than 51,000 male health professionals; the Nurses' Health Study, which included more than 121,000 women nurses; and the Nurses' Health Study II, which followed nearly 117,000 women nurses. During the study follow-up, there were about 15,000 cases of type 2 diabetes. When they looked at total dairy intake, they saw no effect on the risk of diabetes. However, when they zeroed in on yogurt, they found one serving a day was linked with about a 17 percent reduced risk. The researchers next pooled their result with other published studies that looked at links between dairy foods and type 2 diabetes. They found a serving of yogurt a day reduced risk by 18 percent. The meta-analysis, in which all the results were pooled, includes 14 different groups with nearly 460,000 people. About 36,000 developed type 2 diabetes. The researchers took into account age, body-mass index and other lifestyle factors. Hu said they did not differentiate between types of yogurt, whether it was Greek-style yogurt or not, and the fat content. While previous studies have found that yogurt is good for maintain a healthy body weight and lowering risk for type 2 diabetes, ''most of the studies were small," Hu said. So his team decided to look at much larger groups. Exactly how the yogurt may help is not certain. 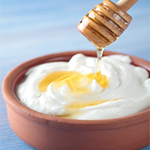 The thinking by many experts is that the probiotics in yogurt ("good" bacteria) alter the intestinal environment in a beneficial way, helping to reduce inflammation and improve the production of hormones important for appetite control, he said. The take-home message, Hu said, is that more study is needed, but that yogurt seems to have a place in a healthy diet. Martin Binks, an associate professor of nutritional sciences at Texas Tech University in Lubbock, said that studies that look at diet are inherently limited in their ability to measure true dietary intake. Even so, he said, the link may warrant future study. It's too soon, however, to change advice about diet based on this research, Binks said. Dr. Osama Hamdy, medical director of the Obesity Program at Joslin Diabetes Center in Boston, points out: "Yogurt in general is beneficial." But he said, "this is an association, not cause and effect."